This entry was posted on Monday, June 1st, 2015 by Frances Ryan. 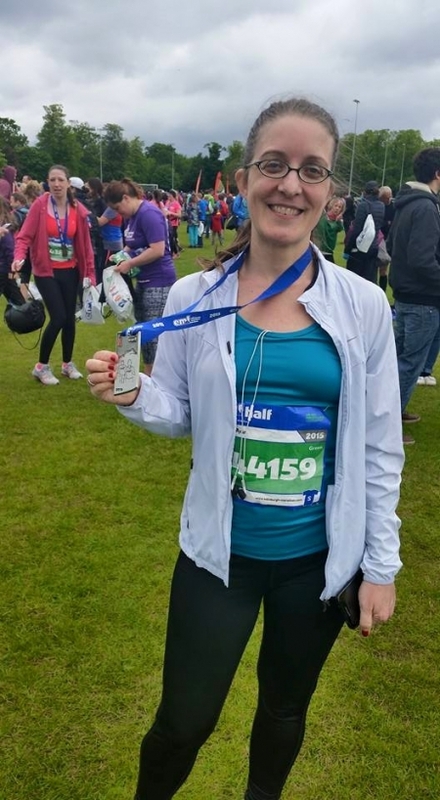 Yesterday was my third running of the Edinburgh Half Marathon. It wasn’t my best showing, but it wasn’t my worst. But I’m actually really pleased with my time and my overall performance. Still, I actually had a good race and I did better than I thought I would. Well, I only came in about three minutes under my goal, but I managed to run more of the course than I expected. In fact, I managed to run the entire first half before I took a walk break at all. Due to my lack of training, my legs gave up on the race right around mile 8. And that meant I had to finish off the race with nothing but my heart and soul to carry me on. So it’s a good thing that I was mentally excited about the race! I have been working in the background on a few of the stresses that have kept me from finding motivation. And, if all goes to plan, I’ll be back on a better training regime before long. After all, I’ve already re-set some of my habits—and that seems to be helping a lot. I have two more half marathons and a full one planned for the year—all on back-to-back weekends—so I’ve got some hard work in front of me. But I’m hopeful that I’ll get better. I think. Maybe. Stay tuned to find out! You can see more of my running photos and race stats here.